Illustration of the difference between SDR and HDR. For a list of games, see games with high dynamic range support. Expanded dynamic range allows for more vibrant colors and greater contrast in supported games on HDR-compatible displays. Support is still low; new games are not guaranteed to support it, wrappers/injectors/overlays without support will look bland and washed out in HDR mode, and tools/features without support won't function properly, such as the inability to capture screenshots using Steam in HDR mode. Some games might support HDR output, but not actually render the game internally in high dynamic range (see HDR rendering), instead merely use tone mapping to map the final SDR rendered image onto a higher dynamic range. This is sometimes referred to as "fake" HDR. This is the modern definition of "HDR" in relation to gaming after the arrival of HDR output compatible TVs and monitors in the 2010s. High Dynamic Range output or High Dynamic Range is a technology that first and foremost enables a screen to display an image at a much greater range of contrast. In practice this usually goes hand in hand with an increased color bit depth from standard 8-bits per color to 10-bits per color or more. In any case, both the software, graphics card (incl. 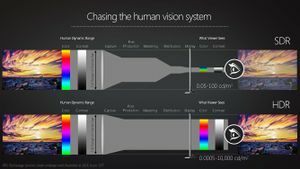 driver), connection and display need to support this technology in order to actually be able to put a HDR image onto a HDR display. For games to fully make use of the expanded dynamic range available on a HDR display, HDR rendering needs to be taken advantage of in the render pipeline of the game, and afterwards the rendered HDR content needs to be output in a HDR display compatible range as well. It is possible for games not rendering in HDR to "fake" supporting HDR output on a HDR display by mapping the colors of the final SDR rendered image over to a higher dynamic range; meaning the game and final image output will not actually take full take advantage of the additional range available. Further on, as the HDR mode of most displays is designed around proper HDR content, this can also result in a somewhat degraded visual experience compared to using the SDR mode of the same display, which is designed around showing SDR content in the best possible way. Windows 10 v1803 ("April Update") and later includes automatic tone mapping of all standard dynamic range content on a HDR display when HDR mode is enabled in the operating system. This feature was added to prevent SDR content from looking dim when displayed in HDR mode, as occurred in previous versions. The operating system allows the brightness for SDR content to be configured under Display settings > HDR and WCG settings > Brightness for SDR content. Consequently, all games lacking proper HDR output and running in window mode (both regular and borderless) will automatically have their SDR output mapped over to the higher dynamic range when HDR mode is enabled on a HDR display. Disable HDR mode in Windows 10 or run the games in exclusive fullscreen mode (with the fullscreen optimizations of Windows 10 disabled) to allow those games to output their SDR content in the SDR mode of the display. This was typically known as "HDR" in relation to gaming in the 2000s before the arrival of HDR output compatible TVs and monitors in the 2010s. High-dynamic-range rendering (HDRR, HDR rendering or high-dynamic-range lighting) is the process of generating computer graphics scenes using lighting calculations done in high dynamic range (HDR). This allows preservation of details that may be lost due to limiting contrast ratios, by mimicking the way cameras and even eyes handle light exposure. It is especially helpful when rendering scenes with multi-layer surfaces, especially when the surface is using normal and specular maps or even highly reflective surfaces (like the water), which can not be rendered correctly in standard dynamic range. Another important area where HDR rendering is useful is exceptionally dark or bright areas as well as transitions between them. Using a dynamic tone-mapping, HDR rendering can adjust the exposure of a scene based on the amount of light in it to simulate a camera lens adjusting to the light. Games rendering in HDR do not necessarily output that image in HDR display compatible range. Due to technical limitations of SDR monitors of the 2000s when HDR rendering became more common, game developers had to map that vastly bigger dynamic range back onto what consumer displays commonly support. Since the introduction of HDR monitors in the second part of the 2010s, games do not have to perform that tone mapping any longer unless the operating system and/or monitor is running in SDR mode. However despite the availability of HDR monitors and inclusion of HDR output in modern versions of Windows, support for HDR output in newer games is still quite uncommon and the majority of games still prefer to map the HDR rendered image onto a standard dynamic range, even if HDR mode is enabled in the operating system. For games that perform rendering in high dynamic range but does not natively support outputting it in HDR mode, it might be possible for modders to forcefully enable this option, such as with the Special K mod for Monster Hunter: World (currently with native HDR support). For PC users, VESA's DisplayHDR certification is relevant as this certification is designed for and around computer monitors and its use in the PC market. The certification breaks the market down into 3 segments of 400, 600 and 1000 cd/m² required max brightness by the display among other details. For typical television displays, the Ultra HD Alliance's UHD Premium certification also exists that is designed around displaying movie and television content on larger displays viewed at a distance. According to the UHD Premium certification, HDR displays must have either a peak brightness of over 1000 cd/m² and a black level less than 0.05 cd/m2 (a contrast ratio of at least 20,000:1) or a peak brightness of over 540 cd/m² and a black level less than 0.0005 cd/m² (a contrast ratio of at least 1,080,000:1). This refers to support in games for providing HDR output on a HDR display. It does not refer to HDR rendering. Games released before 2017 have no support for HDR output, unless it was patched in later or enabled through the use of a third-party mod. Windows 10 v1703 ("Creators Update") or later as well as a HDR compatible graphics card, connection, and display are required in order to actually be able to show HDR content inside of only a window. Refer to the game-specific articles for details on how to enable HDR support. Applications running in fullscreen mode do not rely on Windows but can use the graphics card drivers and proprietary APIs to bypass the OS. Note that Windows 10 v1803 ("April Update") and later performs automatic tone mapping of SDR content when HDR is enabled, which is not the same as if the game natively supported HDR output. To see if that tone mapping feature is being used, play around with the Display settings > HDR and WCG settings > Brightness for SDR content while the game is running in a window. If the brightness of the game changes then it outputs in SDR and does not support HDR output natively in window mode. However if the brightness does not change then the game properly outputs in HDR. This is the state of the thing now, at least. I hope that Microsoft/Nvidia/someone comes up with an automatic SDR->HDR translation layer soon, because currently it's quite bad. This page was last edited on 17 January 2019, at 11:57.